Now, 300 watts of energizing music can fill the room, without wires or complex speaker configurations. Inspired by the legendary JBL Century L100 loudspeaker, the JBL Authentic L16 blends classic acoustic speaker designs and advanced wireless technology. 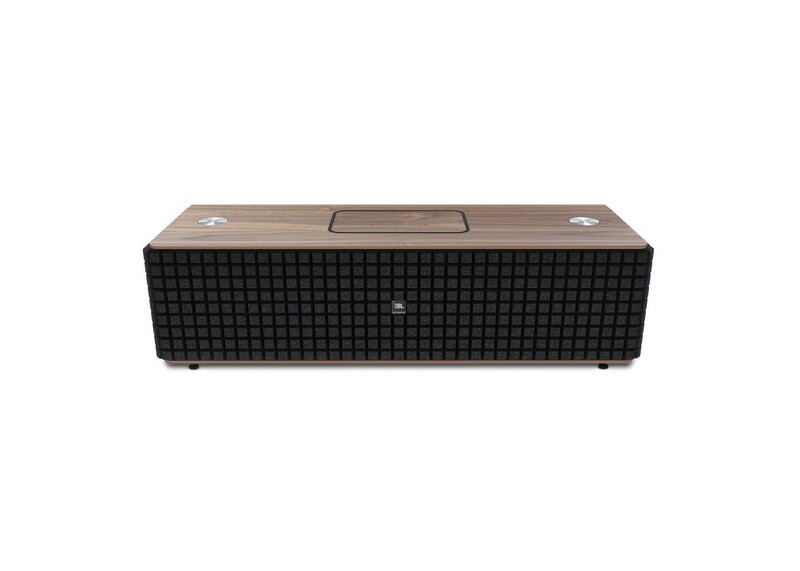 It offers a real, walnut-veneered wooden enclosure, exceptional audio quality and easy wireless connectivity to a wide range of devices via AirPlay, DLNA and Bluetooth. The free JBL MusicFlow app lets you easily control the speaker with iOS or Android mobile devices, and even charge compatible mobile devices on the speaker’s built-in USB ports. Interchangeable foam grills in different colors and Qi wireless charging are also available options, sold separately. Enjoy studio-quality JBL stereo sound from a single, stylish enclosure. Harman Signal Doctor technology improves the quality of compressed audio streams making your music sound amazing, wherever it comes from. High-performance JBL drivers paired with a meticulous acoustic design deliver unmatchable sound from a mid-size speaker. The optimized low- and high-frequency transducers combine with advanced studio quality 24 bit/96 kHz electronics and DSP to present full-range stereo sound with a wide stereo image – all from within a single enclosure. Wherever you play it, expect applause. The JBL Authentic L16 provides easy wireless audio playback from the latest and best in wireless devices. It offers AirPlay for iTunes and iOS devices, DLNA for Android devices and Windows PCs and Bluetooth connectivity – including instant Bluetooth pairing by way of Near Field Communication (NFC) technology. The speaker automatically switches streaming formats as needed, simplifying use with all your devices. For those who still have a large CD or vinyl collection, you can connect your CD player or turntable to the L16 via the optical or RCA phono inputs for a truly authentic experience. The JBL Authentic L16 has two USB ports, one for charging phones, the other for charging tablets, and an optional wireless charging module that makes recharging your Qi compatible mobile device easy. No worrying about connectors; just place your device on the charging pad and let L16 do the rest. The wireless charging option is another way the JBL Authentic L16 keeps your living space – and lifestyle – clutter-free. A lot of today’s music is compressed, to enable for fast and efficient streaming, however, when compressed, you lose the detail in the music. Harman Signal Doctor improves compressed music streams by replacing lost information, making sure your Authentics speaker is always performing at its best.